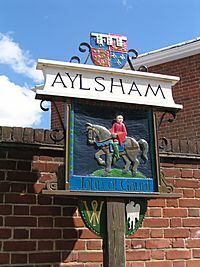 For the village in Kent, see Aylesham. 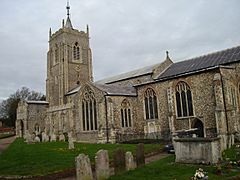 Aylsham is a historic market town and civil parish on the River Bure in north Norfolk, England, about 15 km (9.3 mi) north of Norwich. The river rises near Melton Constable, 18 kilometres (11 mi) upstream from Aylsham and continues to Great Yarmouth and the North Sea, although it was only made navigable after 1779, allowing grain, coal and timber to be brought up river. The civil parish has an area of 17.52 square kilometres and in the 2001 census had a population of 5,504 in 2448 households, reducing to a population of 3,999 in 1,591 households at the 2011 Census. For the purposes of local government, the parish falls within the district of Broadland. The Aylsham town sign, typical of many Norfolk village signs, stands at the entrance to the town. It depicts John of Gaunt, Lord of the manor from 1372. Archaeological evidence shows that the site of the town has been occupied since prehistoric times. Aylsham is just over two miles (3 km) from a substantial Roman settlement at Brampton, linked to Venta Icenorum at Caistor St Edmund, south of Norwich, by a Roman road which can still be traced in places - that site was a bustling industrial centre with maritime links to the rest of the empire. Excavations in the 1970s provided evidence of several kilns, showing that this was an industrial centre, pottery and metal items being the main items manufactured. In 1519 Henry VIII granted a market on Saturdays and an annual fair to be held on 12 March, which was the eve of the feast of St Gregory the pope. Aylsham markets have always been an important feature of the town, and businesses developed to meet the needs of the town and the farming lands around it. Besides weekly markets there were cattle fairs twice a year and, in October, a hiring fair. The Market Place and surrounding area is dominated by the tower of the parish church of St Michael and All Angels, a fine example of Gothic architecture of the Decorated style. The small spire on top of the 30 metre (98 ft) tower is also a landmark that can be seen for miles around. The nave, aisles and chancel were built in the 13th century. The tower and ground floor of the south porch were added in the 14th century. The north transept was built under the patronage of John of Gaunt, Duke of Lancaster around 1380. An upper floor to the porch was added in 1488. The lower part of the rood screen survived the destruction visited by Oliver Cromwell and the Puritans, although some of the painted panels were disfigured. The ancient but natural transport route for Aylsham would have been the River Bure, but it was not open to substantial navigation. There was a scheme in the 18th century to widen the navigation from Coltishall to Aylsham and, after many difficulties, trading wherries from Great Yarmouth were able to reach a staithe at Aylsham. The final end for this scheme was the devastating flood of 1912. Road transport for Aylsham was very important. It was the principal coaching point on the Norwich-Cromer road, and the meeting point for other roads. Each day the coaches from Cromer and Holt would draw up at the Black Boys, the main inn in Aylsham market place. Coaching ended with the coming of the railways in the 1880s. There were many different plans for railways, but eventually two lines served Aylsham, with the town having both North and South stations until the 1950s. Aylsham once had two railway stations, both now closed, Aylsham South railway station on the Great Eastern line between County School railway station (near North Elmham) and Wroxham and the other Aylsham (North) railway station on the M&GNJR line from Melton Constable to Yarmouth. Aylsham is also the terminus for the Bure Valley Railway (on the site of Aylsham South railway station), the Bure Valley Path and the Marriott's Way long distance footpath. Blickling Hall, the great country house in the care of the National Trust, is a mile and a half (2 km) away. With its dramatic symmetrical front, flanked by two great yew hedges, it is a fine example of a Jacobean brick-built manor house, and was formerly the home of the young Anne Boleyn, later to become Henry VIII's second wife. Aylsham was once noted for its spa, situated about half a mile south of the town, comprising a chalybeate spring, formerly used by those suffering from asthma and other chronic conditions. The Tourist Information Centre office is located adjacent to the Bure Valley Railway station. Local entertainment in the town includes concerts by the Aylsham Band, which plays at venues in and around Aylsham; the Aylsham Players who host one or two productions a year; and Aylsham High School, which presents an annual school musical. The annual Aylsham Show features agricultural exhibits and takes place on August Bank Holiday Monday at nearby Blickling Park. The town is located on the A140 major road, a route which runs between Ipswich and Cromer, via Norwich. It is served by a half-hourly bus service to Norwich, Sheringham and Holt. Today Aylsham remains well known for its twice-weekly market and its Monday auctions. It is a popular town for people working in Norwich, but remains an active local business centre in its own right, particularly in the support of agriculture. Today the town has a population of about 5,500, several local industries and still serves the needs of a wide area with twice weekly markets and a farmers' market on the morning of the first and third Saturday of each month. The Aylsham Partnership was formed in 2001 to implement the Market towns Initiative in Aylsham. The Partnership included elected members of County, District and Parish/Town Councils in the Aylsham County Council Division and representatives of other statutory bodies and community organisations. Aylsham came fourth in the world in an international competition celebrating liveable communities, winning a Silver Award in category A (towns with a population up to 20,000) of the International Awards for Liveable Communities, held in La Coruña, Spain in November 2005. The Market Towns Initiative finished in 2004 but the Partnership successfully bid for funding to take part in the Cittaslow pilot project and to sustain work on traffic management and heritage. As a result, Aylsham became one of the founding towns, and the first in Norfolk, of the Cittaslow movement, an international organisation promoting the concept of 'Slow Towns' ("a Network of towns where Quality of Life is important"). It is claimed that Aylsham did not have to change to become a member, as it was already a clear example of the type of community advocated by the Cittaslow movement. Aylsham became Norfolk's first plastic-bag-free town on 3 May 2008, although it proved difficult to continue implementation of the initiative owing to lack of support. Tesco's new store built from wood, recyclable plastic and other sustainable materials, and claimed to be the "greenest in the world" opened in the town July 2008. The Aylsham Heritage Centre is located in a Victorian building within the grounds of St Michael's Church. Archives stored at the centre can be used to research the town's past. Aylsham Facts for Kids. Kiddle Encyclopedia.